Lewis and Clark Expedition (1804-1806) - An expedition to explore the newly acquired Louisiana Purchase territory and to find a passage to the Pacific Ocean. Began in 1804 and ended in 1806. 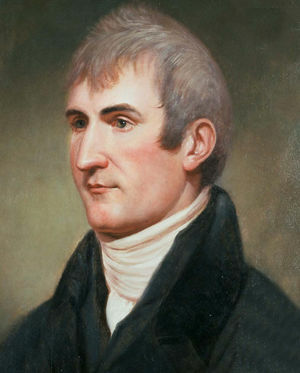 In 1801, Captain Meriwether Lewis was appointed as an aide to then President Thomas Jefferson. After the Louisiana Purchase in 1803, Jefferson chose Lewis to lead an expedition to explore a western route to the Pacific through the new territory. Lewis recruited William Clark to share command of the expedition and Clark enthusiastically accepted. Lewis and Clark carefully chose the expedition members and formed what would become the "Corps of Discovery". The Corps of Discovery was a military organization with Captain Meriwether Lewis the ranking member. 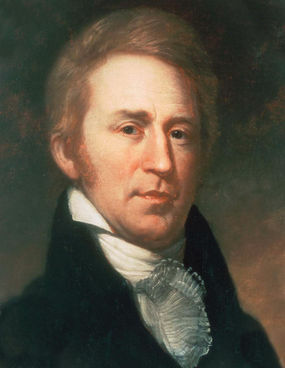 William Clark, when he signed on from civilian life, expected a commission and hoped that it would be as a captain to reinforce his shared command status. When the commission arrived it was as a 2nd Lieutenant and Clark was disappointed but by then he had established his authority and it did not matter. The expedition left Camp River Dubois across from St. Louis on 14 May 1804 and spent the winter of 1804-1805 at Fort Mandan in present day North Dakota. While at Fort Mandan the expedition employed Toussaint Charbonneau and his young pregnant Shoshone wife named Sacagawea, who would later prove to be invaluable when the expedition encountered her people. On 7 Apr 1805 the expedition departed Fort Mandan in six small canoes, and two large perogues. At the very same time the river barge that had brought them to Fort Mandan was sent back to St. Louis with six soldiers, two Frechmen and an Indian aboard. The barge was accompanied by a canoe with two Frenchmen. The two vessels carried the "return party" along with the papers and specimens that would be sent to Washington as an interim report to the President. The Lewis and Clark Expedition successfully portaged the Great Falls of the Missouri, navigated to the headwaters of the Missouri River at Three Forks, crossed the Rocky Mountains and reached the Pacific Ocean at Cape Disappointment in present day Washington State. They built and then spent the winter of 1805-1806 at Fort Clatsop near the mouth of the Columbia River in present day Oregon. The expedition returned to the starting point at St. Louis on 23 Sep 1806 after examining other river basins along the way. The expedition's carefull documentation of the journey with detailed maps and observations as well as a compelling set of day-by-day narrative journals, captured the public's imagination and made the Corps of Discovery national heros. Pvt Frazer, Robert 17?? 1837 1804 ? Pvt Hall, Hugh 1772 18?? 1804 18?? Pvt Howard, Thomas 1779 18?? 1804 180? Boatman Deschamps, Jean-Baptiste 1805 Return party? Boatman Malboeuf, Étienn 1775 Return party? Boatman Pinaut, Peter 1776 1804 1805 Return party? Boatman Rivet, François 1757 1852 1804 1804 Return party? The Journals of the Lewis and Clark Expedition. 2005. U of Nebraska Press / U of Nebraska-Lincoln Libraries-Electronic Text Center. This page was last modified 20:31, 2 July 2017 by John Stanton.